Summer is headed back to the Mid-South! An uncommon mid-latitude weather system has made for cooler weather in the Mid-South to end the week. While these systems are no stranger to the area, they certainly aren't as common in the middle of the summer. This system has brought northwest flow, or widespread northwest winds in the mid and upper levels, that help usher in (relatively) cool, dry air. As a result, we have seen near record low temperatures at night and quite comfortable high temperatures during the day. National weather map at 3pm Sunday, showing very comfortable temps for summertime all the way into the Deep South, while dewpoints (humidity values) are also well below normal (less than 60 as far south as the Lower OH Valley), thanks to surface wind from Canada circulating into the Ohio Valley. 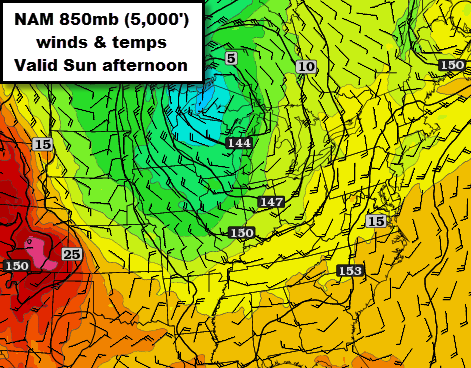 850mb pressure pattern, wind, and temps. A strong area of low pressure resides over the western Great Lakes, bringing northwest wind into the Ohio Valley and northerly wind into the Mid-South. This pattern is atypical this time of year because a different type of pattern usually dominates the south. This includes a semi-permanent area of high pressure that sets up off of the east coast of the U.S., bringing long periods of southerly winds, streaming warm, humid air into the region. As the aforementioned mid-latitude low pressure system weakens and recedes to the north, our more typical Bermuda high-dominated weather will return and give us a real taste of summer in the Mid-South. There will also be chances for showers and thunderstorms toward mid-week due to lingering effects of the low pressure system to our north. By next weekend we could be pushing towards a heat wave. It certainly does not take long for summer to decide to return, enjoy the nicer weather while it is here! By Monday evening, the low in the Great Lakes weakens and moves east, allowing southerly flow over the Plains to re-establish and shift east into the Lower Mississippi Valley. Here comes summer again! Re-visiting the summer storm of July 22, 2003 - "Hurricane Elvis"
Monday, July 22, 2013 marks the 10 year anniversary of the "Mid-South Summer Storm of 2003," or as it is now called in Bluff City lore - "Hurricane Elvis." 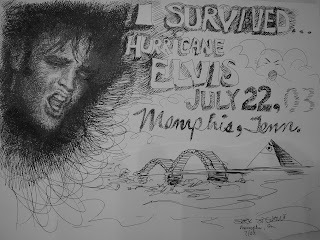 Like the Ice Storm of 1994 and Super Tuesday tornado that struck Hickory Hill, Hurricane Elvis is a weather event that is ingrained in the psyche of anyone who lived in the Memphis metro that summer. In meteorological-speak, Hurricane Elvis was a "derecho" that formed from a mesoscale convective system. A massive tree was uprooted on Belvedere Street. Photo credit Mike Maple, The Commericial Appeal. In other words, a line of thunderstorms with some damaging wind reports is NOT a derecho in and of itself. In addition, a line of storms cannot be called a derecho until it has met ALL of the above criteria (which is not when it first forms, as some media outlets are known to do, but hours into the event). The environment across the Mid-South on that fateful Tuesday morning was primed to support severe thunderstorms, despite being at diurnal minimum (lowest heat content in the atmosphere, which is typically just after dawn). At the surface, a weak stationary front was draped across the metro and had stalled, as fronts typically do in this part of the country in the summer. Low-level moisture had pooled along and ahead of the front as surface dewpoints were in the mid 70s. 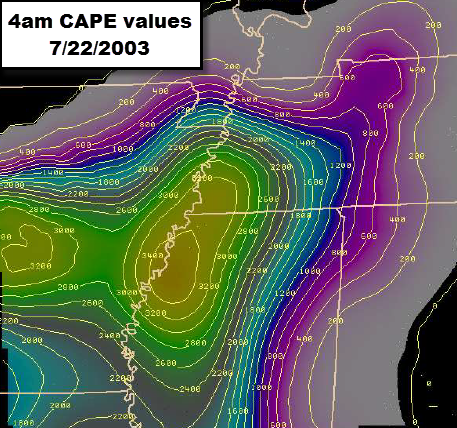 The atmosphere over the metro was highly unstable for 6am (CAPE was 3400 J/kg per McNeil, et al). Aloft, drier air was present in the mid levels of the atmosphere (a recipe for downbursts) and the Mid-South was positioned in a northwest flow regime. In northwest flow, winds aloft blow from northwest to southeast - a prime pattern for mesoscale convective systems (or large areas of thunderstorms) to affect the region as upper-level disturbances rode the northwest wind into the region. An upper level trough was located to our north and northwest and the jet stream was to our north, positioning the Mid-South in a favorable environment for convection with diverging wind (a pattern in which the wind separates, or diverges, from a common point) over the area at jet stream level. All of these were ingredients for severe weather that morning. 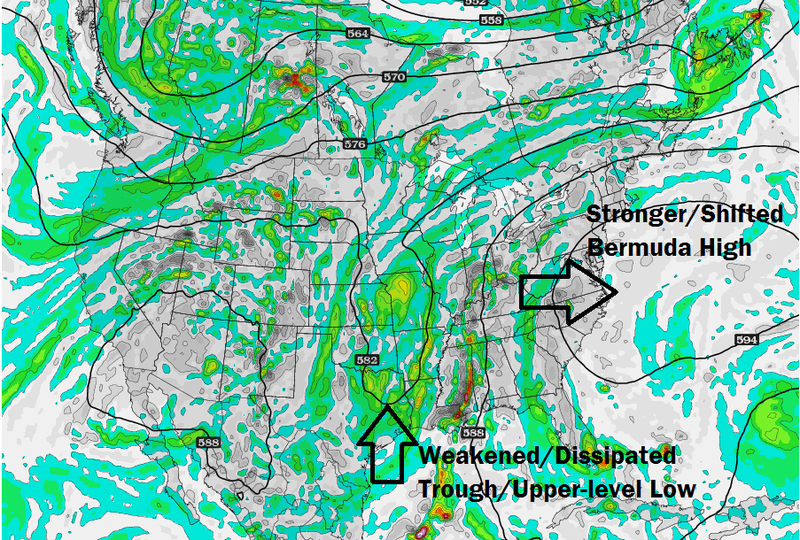 Meanwhile, one of those pesky upper-level disturbances had induced thunderstorms over the Ozarks in the wee hours of Tuesday morning and they strengthened as they rode the northwest flow into the area and encountered a very unstable airmass. As they did so, the storms, now a series of supercells with a history of producing damaging wind across northern AR, coalesced into a bow echo with strong inflow wind on the rear side of the line causing supercells to merge just across the river from Memphis. 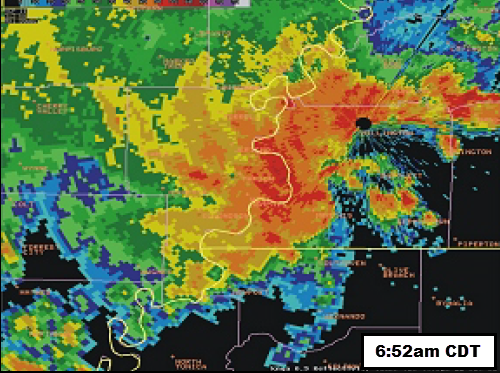 When they merged, the inflow wind was aided by convective downbursts and hit the ground just before 7am with a force Memphians will never forget. Radar reflectivity as the bow echo/derecho raced through Midtown, where much of the most significant damage occurred. Courtesy McNeil, et al (2003). The storm began producing severe wind gusts over northern AR around 3am, peaked in the Memphis metro and along the TN/MS state line between 6-8am, then continued east into northwest AL and far southern middle TN from 9-10am. Once it was all said and done, there was plenty of evidence to rate the storm not only a derecho, but likely one of the worst to ever hit Memphis. The derecho's path length was 400 miles and it traveled this distance in a period of 7 hours - a forward speed of nearly 60 miles per hour! Seven-hour path of the Mid-South Derecho, courtesy NWS-Memphis. 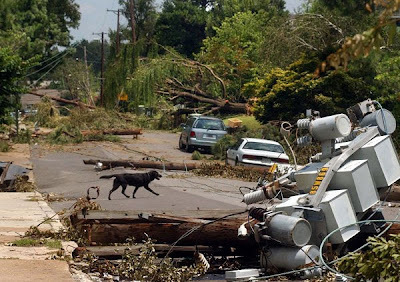 The "Mid-South Summer Storm of 2003" caused extensive damage across the region (estimates were more than $500 million in 2003 dollars), but was concentrated in Shelby County. Other areas hit hard were northern Tunica County, DeSoto County, Fayette County, and points east along the TN/MS state line. 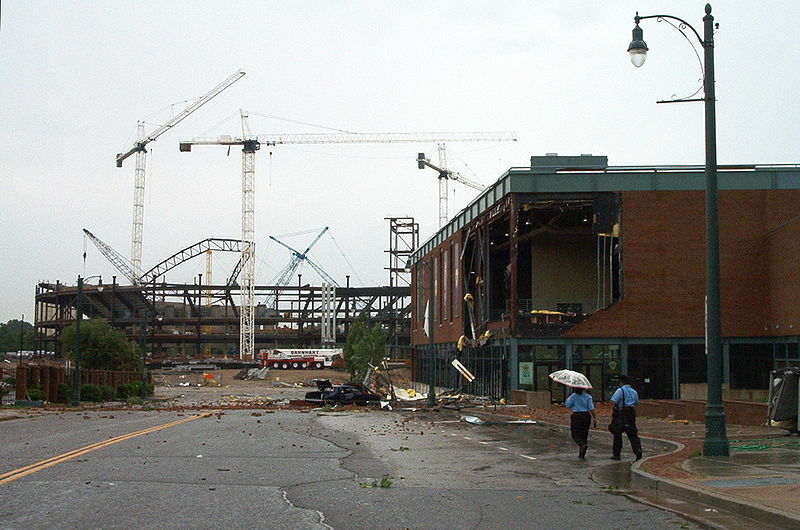 The derecho brought torrential rain and extreme wind reports that topped out at 102 mph from a weather station at AutoZone Park and unofficially 108 mph from a barge on the Mississippi River. Other gusts included 84 mph at WREG-TV on the riverbank south of downtown, 77 mph at the Agricenter, and 61 mph at Memphis International Airport. One death was directly attributed to the storm (from a falling tree), while six others died in the aftermath from various related accidents, fires, and carbon monoxide poisoning. 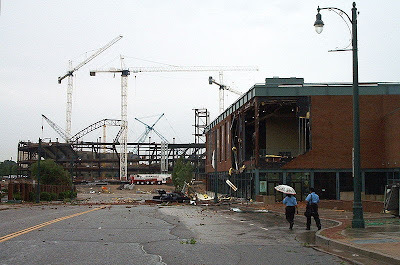 Damage to the Gibson Guitar Factory and a leaning crane on the FedExForum construction project. Photo credit Jeremy Atherton. 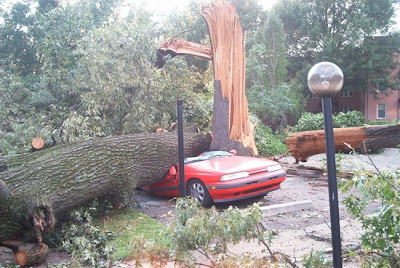 In the storm's path, many trees were torn down causing the most damage by falling on houses and cars, in the streets, and most of all on power lines. More than 1.1 million cubic yards of tree debris was collected in the weeks following the storm. The wind and falling trees left more than 1,300 power poles damaged, caused 2,000 transformers to blow, and downed 76 miles of wire. At the end of the storm, some 750,000 people (~338,000 of Memphis Light Gas and Water's [MLGW] customers) had lost electricity in Shelby County alone, as 279 of their 435 circuits were knocked out. MLGW worked diligently, including doubling its workforce through contract workers, to re-build the electrical grid and restore power. Over 100,000 people were still without power after ten days and many residents had to wait as long as 16 days in the blistering summer heat to have their power restored. The utility alone suffered $30 million in damage. Linden Avenue looked like many other Midtown streets following the storm. Photo by Mike Maple, Commercial Appeal. Also in Midtown, Scott McNeil of the NWS took this picture on Central Avenue. The derecho caused 600 of the 800 traffic lights in Memphis to malfunction. Therefore resident's commutes to and from work took much longer. The powerful wind also caused a crane that was a part of the FedExForum construction project to bend, which resulted in Beale Street being shut down temporarily due to the hazardous conditions overhead. Some areas experienced flash flooding as well. For example, Idlewood Elementary had its entire cafeteria flood and ten classrooms were heavily damaged as part of its roof was blown off. Memphis International Airport was closed for a time after the storm and President Bush declared a federal disaster area for Shelby County, clearing the way for federal assistance during the recovery effort. In the suburbs, 80% of the Germantown area experienced power outages. Bartlett had 1,000 homes and businesses with damage. Lakeland had a total of 500 houses with damage. The Collierville area had 469 homes damaged. During the time after the storm, the crime rate rose significantly. Between July 22 and August 4, residential burglaries rose from 431 the year before to 514 in 2003. Business burglaries also rose from 113 to 218. Because there was no power, many citizens resorted to using candles as an alternate source of light. Due to the use of candles, some fires broke out, one of which caused the death of a two month old baby. Because it was summer in Memphis, many invested in a generator to power air conditioners and fans. Although this may have helped them cool off, carbon monoxide poisoning became a problem. In one case, ten people were found unconscious in their home and a toddler died. Even though Memphians without power will remember sweltering conditions, records indicate that in the 16 days starting on July 22 (the period of time it took to restore all power), the average high was only 87 degrees and only 6 of those days saw a high of 90. A couple of days did reach the mid 90s however, and overnight lows in the 70s much of that period contributed to the heat issue, as it didn't cool off enough at night to provide some even a few hours of relief on many nights. 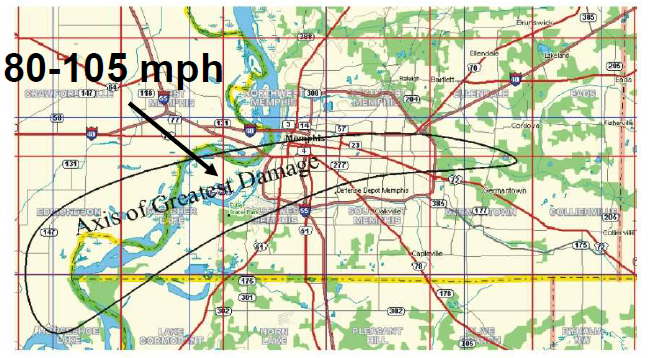 The National Weather Service report (McNeil, et al) points out that, given radar systems in place at the time and the angle that the storm was coming into the county, the NWS was prevented from seeing the full magnitude of the wind velocity before the damage reports started rolling in. However even with this limitation, a Severe Thunderstorm Warning was issued for Crittenden County at 6:15am and for Shelby County at 6:29am, about 12 minutes prior to the storm reaching downtown. That warning, and a subsequent re-issuance, were in effect for Shelby County until 7:30am. Warnings were also issued for counties downstream prior to the storm arriving. A warning issued at 7:02am for DeSoto and Marshall County was the first to mention a "history of wind damage," though the magnitude of wind damage was not given. At 7:16am, the Shelby County warning was re-issued with the wording "wind damage has been reported across Shelby County," but there was still no enhanced language indicating the extreme nature of the damage. Three minutes later, a Fayette County warning indicated "widespread wind damage across Shelby County." Obviously, the extent of the damage was arriving in the NWS office as the storm moved through Shelby County and efforts were made to increase the strength of the wording in subsequent warnings. From having personally read weather warnings and follow-up statements for the past decade, great advancements have been made in the warning process, including more use of enhanced language, regular use of severe weather statements that follow a warning with additional information on the threats posed, and certainly the 2007 transition to polygon warnings for specific areas independent of political boundaries. In addition, new tools and radars are providing even more information and data to NWS warning forecasters. However, there is still work to be done in this area. We are currently in an era of modernizing the warning process even further, including the use of social scientists and surveys to determine what the best way is to get a strong message out to the public to minimize apathy and increase awareness. Johns, R. H. and W. D. Hirt, 1987: Derechos: widespread convectively induced windstorms. Weather Forecasting, 2, 32-49. WMC-TV special, "Destruction at Dawn", August 2003. If you were hoping for better rain chances this week, then you're in luck! 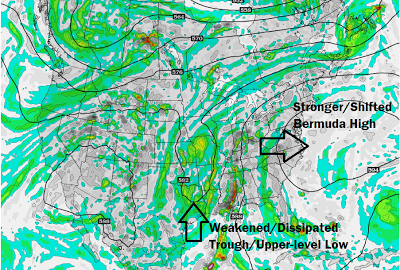 A weather pattern that emerges maybe a couple of times a summer will take hold this week, in the wake of an unusual upper-level pattern in mid-July that brought east-to-west moving storms. Until a couple of days ago, the Bermuda high pressure system - typically stationed over the western Atlantic and southeast U.S. in the summer - relocated to the Ohio Valley and Midwest, bringing record high pressure to Ohio and Pennsylvania (see "'Drunken' Weather Pattern Brings Deadly Heat" by Climate Central). Anti-cyclonic (clockwise) flow around the high meant that precipitation that affected the Mid-South moved from east to west - exactly opposite of what we usually see, and what our friend @NashSevereWx on Twitter refers to as "Crazy Ivan" storms, referencing sharp turns made by Russian submarines in The Hunt for Red October (listen to the use of the term in this YouTube video if you're interested). Now that the rare "Red October" pattern has straightened itself out, another large eastern U.S. trough, like the setup we had early in July, puts the Mid-South squarely in a "northwest flow" regime, in which our mid-level wind (at ~20,000') will be blowing from the northwest (see graphic below). Summertime northwest flow is notorious for producing rounds of showers and thunderstorms, some of which become mesoscale convective systems (MCS's) that bring very heavy rain, thunder, gusty wind, and occasionally severe weather in the form of damaging wind and hail. In fact, "Hurricane Elvis" (which happened ten years ago tomorrow) was exactly one of these types of events - a northwest flow MCS that became a derecho with extreme wind and sheets of rain. We're not predicting anything close to that this week, as many factors have to come together perfectly to produce an event of this magnitude, but we'll be on the lookout for anything that might bring the chance of severe weather. Timing of these rounds of storms can be difficult as the upper-level impulses that drive them can be somewhat unpredictable more than a couple of days out, however current thinking is that the Mid-South may be in line for these disturbances on Monday morning, Tuesday morning, and Wednesday afternoon. Obviously this is all subject to change, and no two disturbances, nor their effects, are alike. For now, we expect heightened chances of showers and thunderstorms as they approach the area. Effects of any morning convection will have major implications on the forecast for the remainder of the day - including temperatures and instability that would normally fire off afternoon summertime storms. Suffice it to say, the forecast from one day to the next could change fairly drastically once we know more about the timing and effects of these northwest flow disturbances! For now, we expect an unsettled week with everyone having a decent chance of a couple of inches of rain by Thursday, locally higher. The GFS model forecast of total precipitation through Thursday AM. Memphis (black dot w/ "M") would receive ~2" of rain from this modeled scenario. The Weather Service forecast of total precipitation through Friday AM. Memphis (black dot w/ "M") would receive just under 2" of rain in this scenario. We'll always have the latest on our social media channels and will update this blog as conditions warrant. Download our mobile app for current loops of StormView Radar, our latest forecast, Twitter feed, and of course StormWatch+ severe weather alerts. Links to the app and social media feeds are listed below. A minor earthquake, centered just southwest of Trumann, AR, occurred at 3:10pm CDT Wednesday afternoon. The epicenter of the magnitude 3.2 quake was 44 miles northwest of downtown Memphis and it's depth was 8.5 miles below the earth's surface. According to the USGS, "weak shaking" was felt by a number of individuals in the immediate vicinity of the quake, but it was not felt even in nearby Jonesboro. 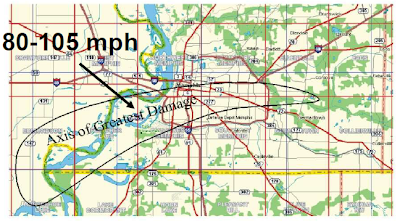 The location is on the southwest tip of the New Madrid Fault zone which extends from this area northeast into the A short video of the location of the quake with respect to the Memphis metro is shown below (Flash required), or click here for a direct link to the video. The USGS "Did You Feel It?" map is below, showing the latest reports of where the quake was felt, and how strongly. Though difficult to read, a helicorder (device used to measure ground shaking) just west of Trumann, AR picked up the earthquake. The helicorder plot below is read left to right, top to bottom, with each new line colored alternating colors (green, black, red, blue) and each line representing 15 minutes. The black squiggles circled in yellow began at 3:10pm CDT and indicate the shaking occurring from the Trumann quake. The helicorder readout shown below is operated by the Center for Earthquake Research and Information at the University of Memphis. Click the image for a full size view. Helicorder display from a station just west of Trumann, AR. The shaking from the Trumann quake is easily seen. In the wake of a cool front that passed through the region yesterday, much driver and somewhat cooler air has infiltrated the Mid-South today and will continue tomorrow. This is resulting in highs in the upper 80s, dewpoints in the upper 50s to lower 60s, and a northeast breeze that makes it feel rather comfortable for mid-July! Heading into the weekend, an upper-level low pressure system will affect the area, but will arrive in an unusual way - moving from east to west across the region, a retrograding pattern! Watch the short video below as MWN meteorologist Erik Proseus explains the forecast motion of the upper low and what it means for the Mid-South. Chances of showers and thunderstorms would be more likely on Saturday if it were not for the dry air in place. However moisture increases Saturday night into Sunday as surface high pressure moves east and wind gets more of a southerly component. The increased moisture, plus being on the eastern side of the low, will mean a little better chance of scattered precip on Sunday and Monday. By Tuesday, and continuing throughout next week, the Mid-South will be back into a more typical summertime pattern, with slight chances of thundershowers each afternoon and evening, highs well into the 90s, and humid conditions we would expect from a Memphis summer! Get the complete forecast from MemphisWeather.net here. Like April and May, June was wetter than normal at the airport, however the precipitation was not evenly spread across the metro and some places came in much drier than normal. Temperatures were just slightly above average and there were no temperature records set during the month. There were two severe weather episodes - on the 5th and 28th. Storms on the 5th prompted Tornado Warnings for the metro and a waterspout was spotted on the Mississippi River from a storm. No damage was reported. On the 28th, a severe cluster of storms (mesoscale convective system) prompted warnings and knocked out power to 8000+ MLGW customers early in the morning. However the most memorable event was a photogenic outflow boundary that strafed the metro. Climate details for June can be found below. The average temperature for the month of June was 79.8 degrees, or 0.2 degrees above normal. The average high temperature was 88.9 degrees and the average low was 70.6 degrees. The coolest temperature of the month was 61 degrees on the 8th, while the highest temperature was 97 degrees on the 27th. For the year, Memphis is 0.9 degrees below average temperature-wise. Precipitation for the month totaled 5.47", which was 1.84" above the average monthly rainfall. Daily rainfall records were set on two days - the 17th (2.45") and 27th (1.34"). There were 7 calendar days with measurable rainfall, four of which recorded at least 0.5" and two which saw 1" or more. 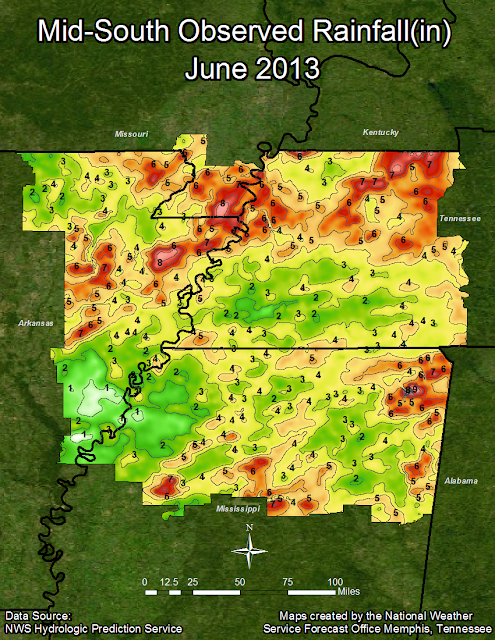 Through June 30, annual precipitation at Memphis is over 12" above the 30-year average. The maximum 24-hour rainfall was the record 2.45" on the 7th. The peak wind gust was 53 mph from the west on the 27th with an average wind speed for the month of 7.3 mph. Click here for a daily statistical recap for Memphis International Airport. The average June temperature at Cirrus Weather Solutions was 78.3 degrees with a maximum of 98.9 degrees on the 27th and a minimum of 57.7 degrees on the 8th. June precipitation measured only 2.20" via the Cirrus automated gauge and 2.17" in a manual gauge used for the CoCoRaHS program, less than half of what the airport reported. The measured peak wind gust was 26 mph on the 28th. Average relative humidity was a sticky 75%. Click here for a daily recap on MemphisWeather.net. For the month of June, the average temperature error in all MWN temperature forecasts was 1.43 degrees, lower than all available computer data models lest one (the NAM) and the National Weather Service forecasts. Over 85% of the MWN temperature forecasts for the month were within 2 degrees of the actual temperature. 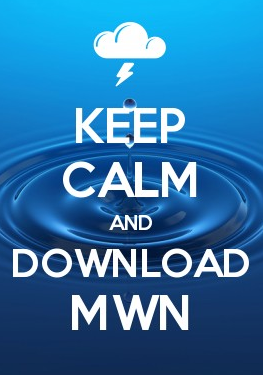 MWN's forecasts extend out five periods (2.5 days, or roughly 60 hours). For dewpoint accuracy, the MWN forecast averaged 2.22 degrees error and fell within 2 degrees of the actual dewpoint 67% of the time. Historical accuracy statistics can be found here. 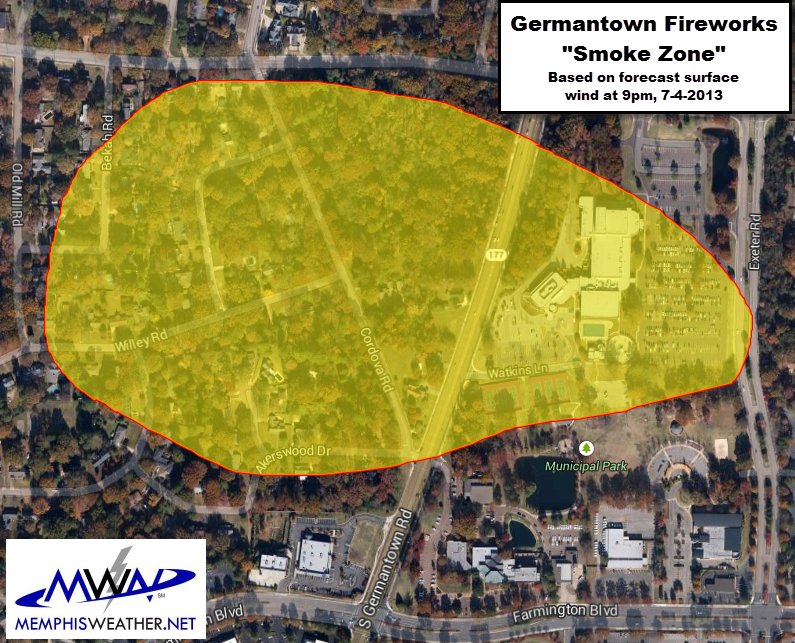 Yesterday, we produced our first "MWN Smoke Zone" forecasts and got some positive feedback, so we thought we'd do it again for tonight's shows downtown and in Germantown. 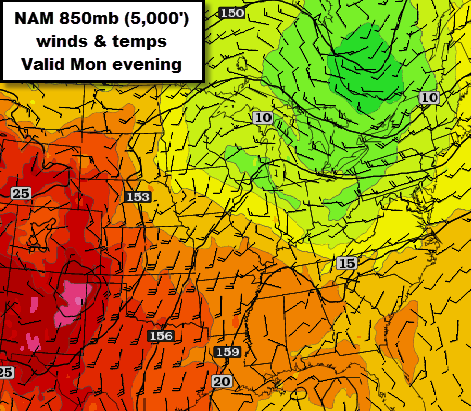 Overall, the weather tonight should be great for July 4th, though maybe not quite as comfortable as last night. Humidity will be a little higher and temps a few degrees warmer, but we won't come anywhere close to the 100-degree reading of last July 4th this afternoon! There is a low chance of a shower around late this afternoon and early evening, but most should be gone by 9pm. Tonight's Smoke Zone forecasts are based on a light east to east-southeast wind at about 5-7 mph. There could be a slight southeast wind that could push the smoke zones slightly farther north than indicated. Smoke from fireworks can be difficult to breathe for folks with asthma or other breathing conditions and it's an annoyance for everyone else! Here's what to expect tonight in Germantown and downtown. Fireworks are shot from the parking lot in front of Germantown Centre on Exeter. Smoke should drift across Germantown Centre itself and probably the northern half or so of Municipal Park, then into residential areas west of Germantown Road between Neshoba Rd and Farmington Blvd. See the map below for a rough estimate of where smoke should travel. Two fireworks displays will occur downtown tonight, one after the Memphis Redbirds game concludes at AutoZone Park around 9pm and another on Mud Island around 10pm. In the case of Mud Island, smoke should cause very little problem for visitors, as it will blow west across the southern tip of the island over the river and into AR. Low-level smoke from Redbirds fireworks may tend to linger a bit in the stadium as wind swirls slightly, however above a few hundred feet, it will blow towards the 3rd base side of the stands and across downtown, generally north and south of Union Avenue by a few blocks either way, before likely moving right over the fireworks site on Mud Island. 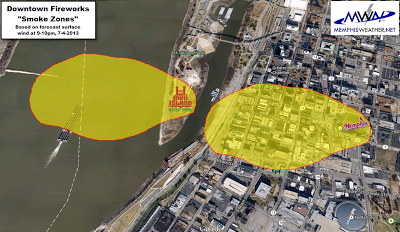 A slight southeast wind would move it overhead the Mud Island Riverpark itself. 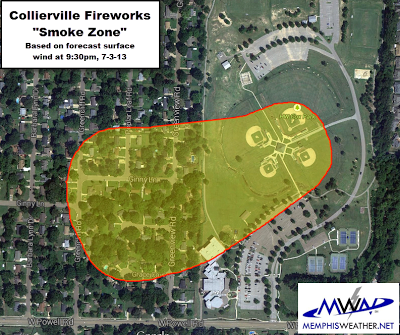 See the map below for a rough estimate of where smoke should travel from both displays. Happy Independence Day, be safe, and enjoy the celebrations! 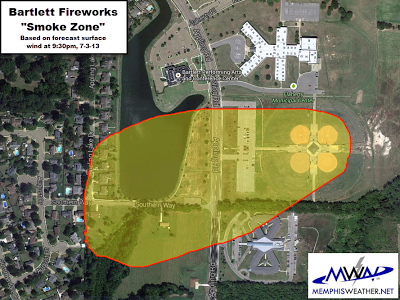 With a few large fireworks shows going on tonight, and FANTASTIC weather to enjoy them, we put together our first "MWN Smoke Zone" forecasts. Smoke from fireworks can be difficult to breathe for folks with asthma or other lung conditions and it's an annoyance for everyone else! Here's what to expect tonight in Bartlett, Collierville, and Millington, based on a northeast to east surface wind at about 5 mph. Fireworks are shot from the ball fields at the Flaherty Municipal Center. Smoke should drift across the fields towards the south end of Appling Lake and just north of Kings Daughters and Sons Home. Those north of the fields by Appling Middle School or Bartlett Performing Arts Center should be in the clear. See the map below for a rough estimate of where smoke should travel. Fireworks are shot from the ball fields at H.W. Cox Park. Smoke should drift across the fields to residential areas west of the park, north of Powell Road and west of Byhalia Road. Areas north and east of the park will have smoke-free viewing conditions. See the map below for a rough estimate of where smoke should travel. This recent weather has been due to an upper-level low pressure system that has stuck around the region, quite literally, being wedged in between two dominant high pressure systems in the western U.S. and western Atlantic. The recent cool spell is due to the presence of blocking high pressure over the western Atlantic and western U.S., while a large trough and upper level low pressure system dominated the Mississippi Valley region - literally with nowhere to go. Ultimately the season of summer will prevail and begin to diminish this unusual pattern we've been experiencing. 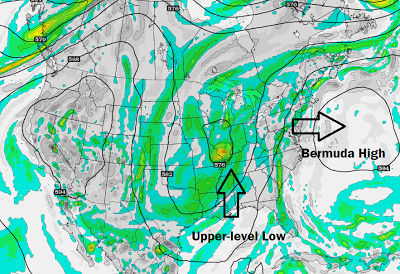 The pattern change will bring increased presence of the Bermuda high, by shifting it farther west (over the southeastern U.S.), which is the more typical summer pattern you would expect this time of year. This means a change in surface wind direction (from north to south), and thus increased humidity and slightly warmer temperatures. However, a large trough will remain to the west of the area which will keep temperatures from getting too hot and allowing chances of rain to continue in the forecast. 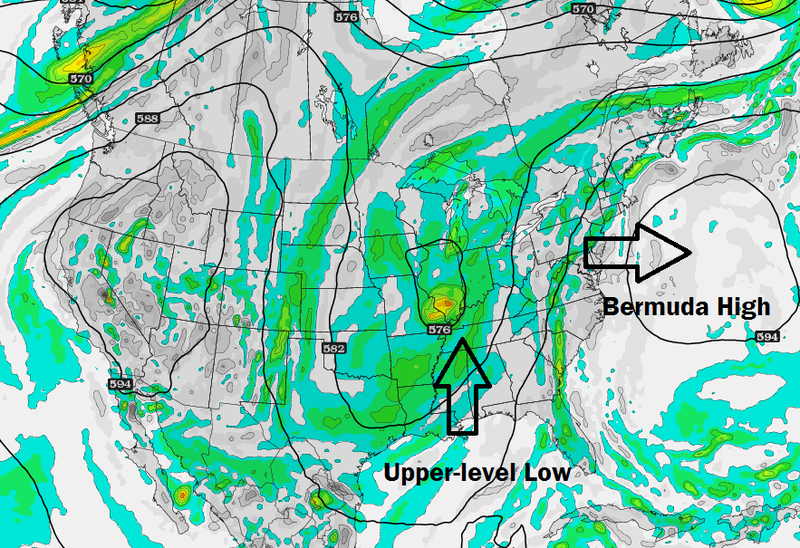 A slight, but important, pattern shift takes place the next few days, with more influence from the Bermuda high over the eastern seaboard, and a weaker trough that will also shift slightly west, resulting in more moisture, humidity, and warmth, as well as higher precip chances. So what does this all mean for the 4th of July? Wednesday into Wednesday night looks the best, with limited cloud cover, pleasant temperatures, and very low precipitation chances for an evening of fireworks. Heading into the 4th of July, clouds and chances for rain increase (slightly) as well as warmer temps and higher humidity. Looking ahead to the weekend, the summer-like pattern looks to stick around with more chances for rain throughout. The bright side is our temps should stay capped out near 90 on the days with the most sun - it certainly could be worse this time of year!